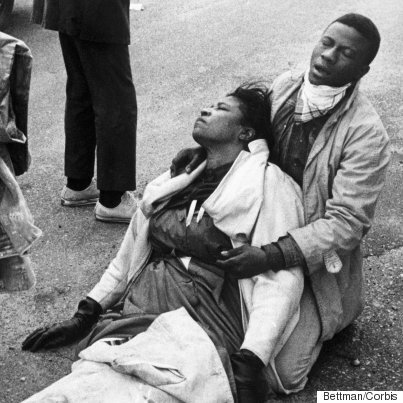 Amelia Boynton Robinson was nearly beaten to death in 1965 during the first march in Selma, Alabama, led by Martin Luther King Jr. She was 53 years old at the time. A graphic photo of Boynton Robinson, severely beaten and collapsed, spread around the world and became an iconic image of the civil rights era. Boynton Robinson survived the brutality and chaos of the time and is alive today to talk about it, at 103 years old. One of the nation's oldest civil rights activists, she remains an essential figure of the movement. She was one of the first people to urge King to travel to Selma in the first place, and was also the first woman and first African-American to ever run for Congress in Alabama. The civil rights activist, dressed in pale yellow and sparking jewels, was honored at the luncheon with Cinema for Peace's Nelson Mandela award. The award was presented by Kweku Mandela, a grandson of Nelson Mandela. Boynton Robinson traveled with friends and family to Los Angeles just in time for Sunday’s Academy Awards, where “Selma” was nominated for Best Original Song and Best Picture (Common and John Legend took home the former award for their song "Glory"). Boynton Robinson is portrayed in the movie, which she calls "fantastic," by actress Lorraine Toussaint. Though she sat in her wheelchair with a heavy coat around her shoulders, Boynton Robinson enthusiastically shared her thoughts into a microphone in a steady and clear voice, and even sang a few lines of a song she and fellow marchers sang in jail together all those years ago. Amelia Boynton Robinson in Los Angeles on Feb. 20, 2015. In January, Boynton Robinson traveled to Washington, D.C., for President Barack Obama’s State of the Union address, attending as the special guest of Rep. Terri Sewell (D-Ala.). “I will forever remember this day,” she said at the time. Boynton Robinson wishes that after everything she fought for, the state of race relations under the nation's first black president were more positive. “I look at our president and see hate coming out of the minds of so many people because of his color,” she said. Boynton Robinson in New York in 2011. But Boynton Robinson is neither bitter nor disappointed. As she looks back on everything she has seen and experienced, her perspective is positive. “It makes me realize that this is where I belong,” she said. In this May 3, 1963 file photo,a 17-year-old civil rights demonstrator, defying an anti-parade ordinance of Birmingham, Ala., is attacked by a police dog. Bill Hudson, an Associated Press photographer whose searing images of the civil rights era documented police brutality and galvanized the public, died Thursday, June 24, 2010 in Jacksonville, Fla. He was 77.